Oh how the other half live! Old King Cole is a classic British nursery rhyme describing how the King called for his pipe, bowl, and musicians with every demand delivered without qualm. Let’s face it, nobody wants to upset Old King Cole, and if you can keep him onside you’ll be in for a treat with some King-sized wins! Rather than following the nursery rhyme to a tee Microgaming’s take on the classic takes a more modern approach as the pipe, the bowl and the three fiddlers he demanded are substituted with a hookah, a bowl of cereal and a girl band which make the King a merry old soul. The girl band’s music accompanies the reels spinning and you’ll feel like dancing along in celebration when you activate the free spins mode as you’ll receive 12 free spins and a random multiplier of up to 7x! 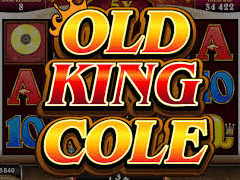 Old King Cole is another addition to Microgaming’s Rhyming Reels series of slots which also includes the Georgie Porgie slot machine and the Jack & Jill slot machine, and there isn’t much difference in its structure. The royal rhyme takes place across 5 reels and 20 paylines enabling you to bet from 1p up to £10 per payline, meaning you can spin the reels with all paylines active from 20p up to £200. Old King Cole loved to have a merry old time with various forms of entertainment, and you’ll certainly be having a fabulous time too as there are lots of big payouts on offer in this royal affair. The main Wild symbol throughout the game is the Old King Cole logo which has the ability to substitute for all symbols apart from the Scatter, as always, and it is also the symbol with the highest payout as five on a payline rewards you with 2,500 coins. The next most valuable symbol on the reels is the golden record which pays 1,000 coins for five on a line, but this actually becomes Wild too should you reach the free spins bonus game. To do so you’ll need three or more Scatter symbols (which will also see you receive Scatter pays) which are represented by Old King Cole’s cherished crown. Of course, Old King Cole is present on the reels too with a big smile as he enjoys his entertainment and you’ll also get to enjoy a girl band playing guitars, smoke a hookah, and eat some cereal, with Ace to 10 symbols falling on the reels too! Prepare for a right royal homecoming when Old King Cole’s crown graces your presence on the reels three or more times during the same spin as you’ll take your position on the throne to enjoy some golden free spins that always see you crowned a big winner. Not only will you be presented with 12 free spins to do as much damage as you can, all wins will be subject to a random multiplier of up to 7x which is quite extraordinary. On top of this you can trigger additional free spins, plus the golden record symbol also becomes a Wild symbol complementing the Old King Cole logo which is the game’s main Wild symbol, thus further boosting your chances of landing lots of winning combinations as you spin the reels for free. Only the best will do for Old King Cole so why should you settle for anything less? Whenever you land winning combinations that don’t fully satisfy you, you’ll have the option to activate the gamble feature to boost them into King-sized wins instead. You’ll then be presented with a music-themed playing card that is face down and you’ll have to decide whether you want to try your luck doubling your winnings or getting a little bit greedier and quadrupling them. To double up you’ll have to decide if the playing card will be red or black when it is revealed, while to quadruple your winnings you’ll have to choose the exact suit that the card is, but tread carefully because an incorrect decision sees your winnings disappear in the blink of an eye! Old King Cole is a welcome addition to the Rhyming Reels range of slots developed by Microgaming, however it is not as impressive as the Georgie Porgie or Jack & Jill slot machines and even the Hearts and Tarts slot machine brings you even tastier treats.